If the GE Spacemaker microwave oven stops working without warning, chances are you need to replace the fuse. This is not a difficult project, and it can save you the expense of buying a new microwave. The fuse works so that the filament will break if there is a power surge. Before you repair the microwave, it is important to determine the cause of the problem to prevent it from happening again. Unplug the power cord from the electrical outlet, or turn the power off at the circuit breaker box if the microwave is hard-wired to the kitchen circuit. Remove the grill at the top of the microwave by unsnapping it. On some models, the grill may have retaining screws that you must remove using a Phillips screwdriver. Remove the control panel retaining screw using the Phillips screwdriver. Pull the control panel away from the microwave and label each of the wires with tape and a marker so that you know their proper positions for reassembly. Unplug the wires from the control panel by pulling them off the posts. Remove the old fuse from the compartment that the control panel was covering by grasping it and pulling it out. Place a new fuse in the compartment and push it firmly into the holder until it snaps into place. Connect the wires to the control panel according to the labels. Place the control panel on the microwave and install the retaining screw with the Phillips screwdriver. Install the grill on the microwave and snap it into place. 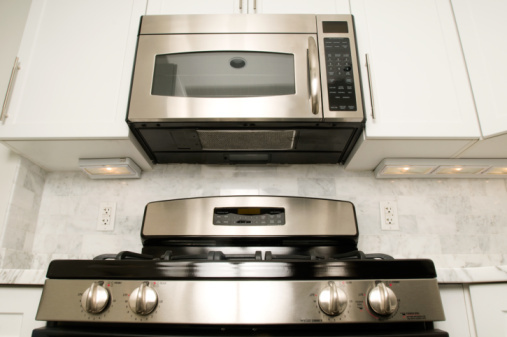 If your microwave grill has retaining screws, install those and tighten them using a Phillips screwdriver. Plug the power cord in for the microwave or turn the power on at the breaker box and program the microwave according to manufacturer instructions. Do not attempt to complete this project when there is power to the GE Spacemaker microwave. If you replace the fuse on your GE Spacemaker only to have it blow again shortly after, something else may be wrong with the microwave. Problematic parts may include the high voltage capacitor, the cooling fan, the door lock or even a piece of loose metal or a loose screw that causes a short circuit. Start by replacing the blown fuse to determine if that part was the sole issue, but if the problem persists, you may need to contact a small appliance repair shop for more in-depth or dangerous repairs.